Under certain conditions, the LAN controller (i.e. 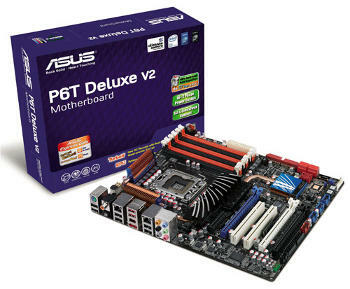 NIC) on an Asus P6T Deluxe v2 motherboard may start sending strange packets after the computer is shut down. This constant stream of packets from the NIC may cause all traffic through your switch to halt. The cause of the strange packets appears to be triggered by a bug in the 'sky2' network driver in Linux. See the information below to learn more about what conditions trigger this behavior and possible workarounds that can be used until the bug is fixed. NOTE: This problem does not apply to Windows users. The P6T LAN controller sends about 50 of these packets per second and after a while this causes all network traffic going through my switch to cease. As you might imagine, it is especially annoying if this happens while I am at work and no longer have a way of accessing any of my systems until I get home. At the time I discovered this, I called Asus technical support to see if this was a known issue or if I could possibly have a faulty motherboard. Calling them was a mistake. All I got was a condescending tone from the other side of the line and a person telling me that it was impossible for the NIC to send packets while the system was shut down. He wouldn't believe what I was telling him. That conversation ended pretty quickly once I realized I wouldn't be getting any support from Asus on this issue. Before I hung up though they did mention that someone with a Maximus II Formula motherboard had called in with a similar issue a week earlier. I later found out that the Maximus motherboard uses the exact same LAN controller as the P6T motherboard, a Marvell 88E8056 chip. I would suspect that any motherboard that uses this Marvell controller would experience the same network problems. Dual gigabit NICs using the Marvell 88E8056 chip. Other motherboards using the Marvell LAN controller may also be affected. I'm not sure if network activity halts when other gigabit switches are used. OS / Distro - I tested on Windows, Express Gate (Splashtop), Ubuntu 9.04, and Ubuntu 9.10. Kernel Version - I tested with the standard installed kernel on all distributions except Ubuntu 9.04 where I decided to test with a vanilla non-patched kernel from kernel.org in addition to the standard Ubuntu kernel. Switch Port Configuration - I used a managed switch and performed tests where the switch port connected to the P6T NIC was configured for either 10, 100, or 1000 Mb/s (and it did make a difference as you'll see in the table). WOL enabled before shutdown? - I recorded whether or not wake-on-lan was configured before the system was shut down (e.g on linux wake-on-lan can be turned on with a command similar to 'ethtool -s eth0 wol g'). Ethernet Link Reset During Shutdown? During some tests, the led link lights on the switch would indicate that the link was momentarily shut down and then reestablished at the time the system was powered down. On other tests, the led link lights on the switch would indicate that the link was never reset during shutdown (as if the link was still operating in the same mode as it was when the system was turned on). In other tests, power to the NIC was shut off and the link was never reestablished (as expected if WOL was not enabled). Ethernet speed after shutdown - During the tests where the ethernet link to the switch was reset after the sytem was shut down, I recorded the speed of the reestablished ethernet link. WOL works? - Shows whether or not wake-on-LAN worked after the system was shut down. For some tests this column is not applicable because WOL was never enabled/configured. Strange packet bug encountered? - Shows whether or not I was able to see the strange packet sending behavior. NOTE: In cases where the packet sending bug was observed, I first had to send around eight broadcast packets on the network to trigger the problem where the P6T NIC started sending the strange packets. I could send any type of broadcast packet. For example, the problem could be triggered by sending either broadcast pings (e.g 'ping -b 192.168.1.255') or wake-on-LAN magic packets (they didn't have to be specifically directed to the P6T NIC MAC address). NOTE: In each case where I encountered the packet sending bug, traffic immediately resumed through the switch after after unplugging the cable from the offending network port. On Windows, where WOL worked and the bug was never encountered, the ethernet link was always reestablished at 10 Mb/s when the system was shut down no matter what speed of the link was when the system was powered on. On Linux, if WOL was enabled, the ethernet link would be reestablished at either 10 or 100 Mb/s when the sytem was shut down (depending on the speed of the link while the system was running). On Linux, when WOL was not enabled and the system was affected by the bug, the ethernet link was never reset when the system was shut down and it remained operating at the same speed as when the system was running. It was as if the NIC was still operating in the same mode as when the sytem was turned on instead of going into a special mode that listened for WOL packets. Status of other distros is unknown. I suspect that this problem may not be kernel-version specific but due to a patch that some distros apply to the sky2 driver...but I am not certain. Anyhow, hopefully this helps somebody that has been experiencing the same network problems and wasn't sure why it was happening (I was worried for a little bit that it might be a faulty motherboard or a failing switch). If this problem gets fixed in the sky2 driver on Linux, I'll update this post to reflect the status. These instructions describe the steps required to get wake-on-lan (WOL) working with an Asus P6T Deluxe v2 motherboard and Windows 7 RTM. Even if you don't have this specific motherboard, the instructions should be sufficient for learning how to enable WOL on most Windows systems. Also, I'll assume that if you found these instructions you already know what WOL is so I'll skip the explanation. NOTE: For Linux users, WOL isn't currently working with the NICs on this motherboard. These NICs use the 'sky2' network driver which has apparently had a history of problems. I've tested on Ubuntu 9.04 and 9.10 with both standard Ubuntu kernels and vanilla 2.6.31 kernels from kernel.org and WOL just doesn't work. I've also found other issues with these 'sky2' driver on Linux and will make another blog post on that subject soon. Each of these steps is shown in greater detail below. Also, in case it isn't clear, since WOL needs to be enabled through the operating system as well as through the BIOS it will only work after you power down from the OS that you enabled the settings in. For example, if you have a dual boot system with both Linux and Windows (and have only enabled WOL settings through Windows), WOL will only work after the computer has been shut down from Windows. Enter the BIOS setup before the system boots and go to the Power tab --> APM Configuration screen and make sure that Power On By PCIE Devices is enabled. The NICs in this motherboard are connected through the PCI-Express bus so Power on by PCIE Devices is the only option you need to enable (i.e. Power On by PCI Devices is not needed). For other systems, you may need to consult your computer or motherboard documentation for information on what settings you need to enable for wake-on-lan support. Update (3/3/2010) - It is no longer necessary to download the network driver from the Asus website. The Marvell driver that is available through Windows Update provides the desired functionality, so just make sure Windows is up-to-date. On Windows 7 RTM (i.e. the final retail version), the network drivers that are automatically added by the OS during installation do not work with wake-on-lan. I had to install the latest drivers from the Asus download site (http://support.asus.com/download) before WOL started working. In the future, Microsoft may provide a more up-to-date driver for these network cards but as of right now (9/11/2009) it is necessary to download the more recent driver from Asus. Open the driver configuration window for the NIC by opening the system Control Panel --> opening the Device Manager --> expanding Network adapters, then right-clicking on the Marvell Yukon Gigabit Ethernet Controller and selecting properties. This will bring up the driver configuration window seen below. Go to the Advanced tab and make sure that Wake From Shutdown is set to On. Also, make sure that Wake-Up Capabilities is set to Magic Packet (you don't need Magic Packet and Pattern Match unless you know what it is). That is it. You should now be able to power off your machine and wake it with your preferred WOL utility/software.